1908 John Baptist Kramer founded Kramos at the end of 1908 in Bath, Somerset. He was a pioneer of small electric drilling and grinding machines, electric lifting magnets and monorail hoists . 1909 Kramer went to Birmingham to join his business with GEC at Witton. Here a much larger scale of manufacturing business was established, under the name of Witton Kramer Electric Tool and Hoist Works. The range of products included separator magnets, brakes, clutches and solenoids. During World War 1, Kramer worked closely with several branches of the British Government. 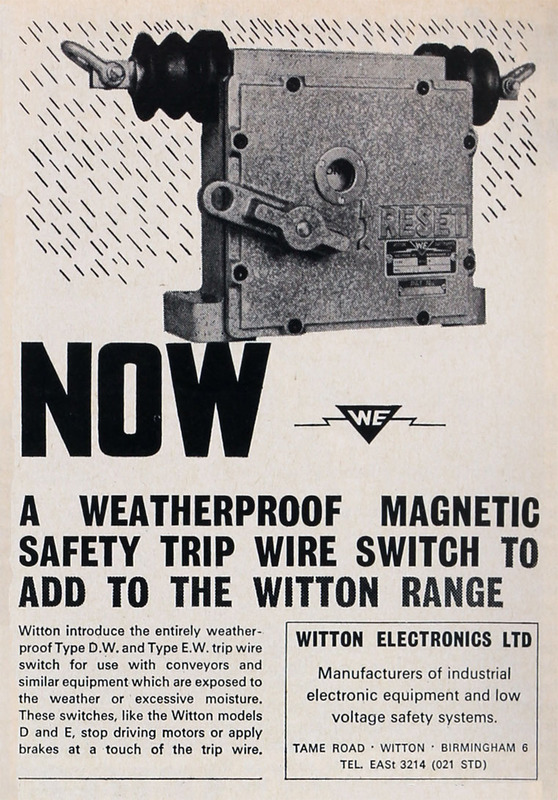 After WW1, production continued to grow at Witton, mainly of large lifting magnets, solenoids, brakes and clutches, cranes and hoists, electric hand drills, grinders as well as a wide range of photo-electric equipment. Kramer retired from Witton Kramer in 1939. WW2 The company worked on a range of experiments and product developments including mine detectors, magnets to immobilise the clocks in time-delay bombs and slip-ring columns for guns and radar towers. In the 1950's-70's, Witton Kramer continued to manufacture brakes, solenoids, clutches, magnets photo-electric equipment, and expanded its range with new products. Following the amalgamation of GEC with AEI and English Electric Co, Witton Kramer took on the production of Perigrip Brakes and Thrustors from other parts of the new group. 1984 As a result of the GEC rationalisation programme in the 1980s, the Witton site became redundant so Witton Kramer moved - the commercial and engineering departments and the brake and thrustor production went to the GEC small machines factory at Blackheath. ; production of the large lifting magnets was transferred to Magnet Electrical Repairs Ltd at Swansea (now Cegelec Electrical Services Ltd). In the 1980's and 90's, growth was limited. GEC Small Machines Co was sold to Hawker Siddeley in 1989, which in turn was bought by BTR Industries in 1991, who merged with Siebe to form Invensys Group. Witton Kramer is now part of Brook Crompton, a member of the ATB Group of Companies. This page was last edited on 29 July 2016, at 13:47.